The Sandhills of Nebraska are like no other place in North America – small, medium, large and gigantic protuberances of sand covered by shallow-rooted grass, green in the growing season wherever there is access to ground water (which is almost everywhere), otherwise brown. You can drive well over two hundred miles from east to west across the Sandhills, and after half an hour or so, your senses dull. Hill and valley, highway and railroad track, all begin to look the same. Driving through the Sandhills can be like going around and around on an amusement park's train ride. Yet if you look closer, if you stop and take the time to explore, you will see an astounding intricacy in design, much as a single drop of water viewed through a microscope reveals creatures and constructs otherwise invisible to our senses. The Sandhills are one of the most fascinating places I have ever visited. Although I am not from them, a part of me resides in that single drop of water. 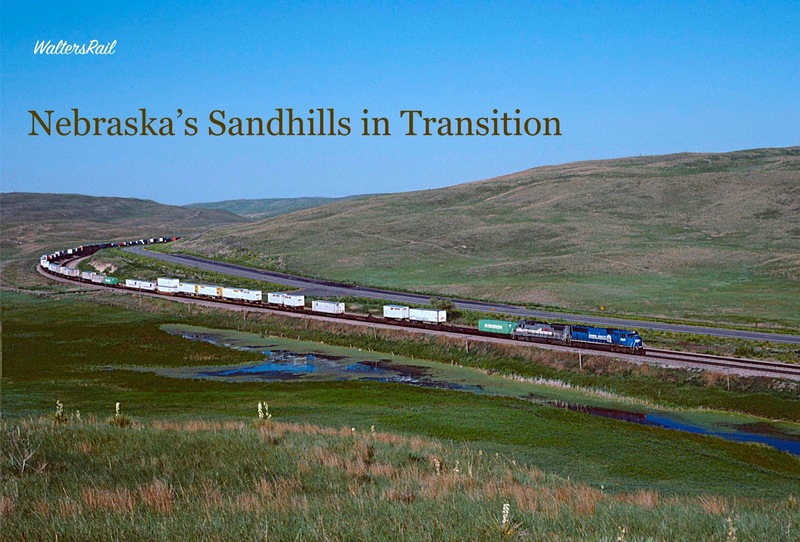 The images in this post were taken in the summer of 1997, a year of transition for the Sandhills. 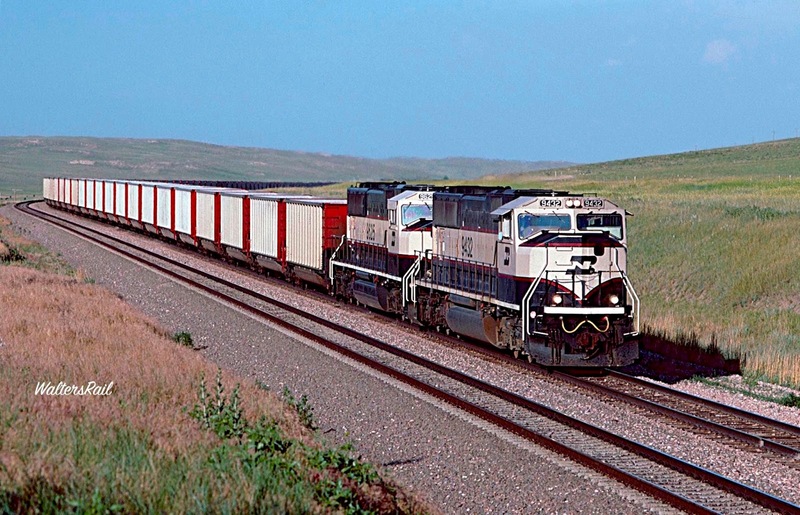 Burlington Northern and the Santa Fe had merged into a mega-railroad, and the motive power through west-central Nebraska was an interesting mix, as in the image above. Every now and then, the new BNSF herald would appear. But the landscape was unchanged, a sea of thinly rooted grass covering hill and valley of sand. 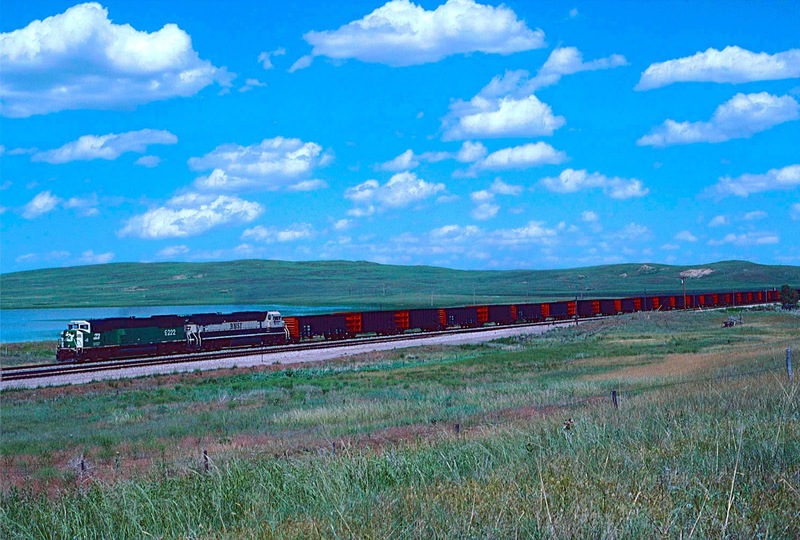 BNSF and BN "Grinsteins" roll a loaded coal drag through the Sandhills, with a hint of groundwater above the motive power. 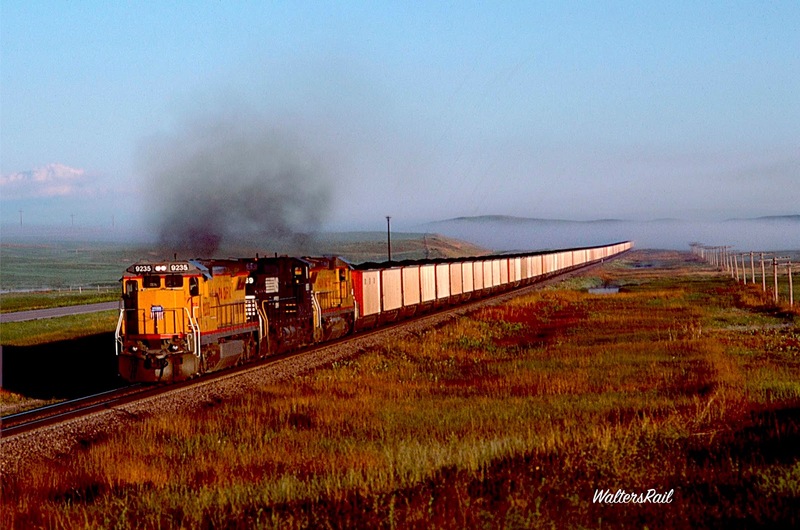 A "dog's breakfast" lash-up from Burlington Northern days heads a high priority Z-train beneath towering sand dunes. 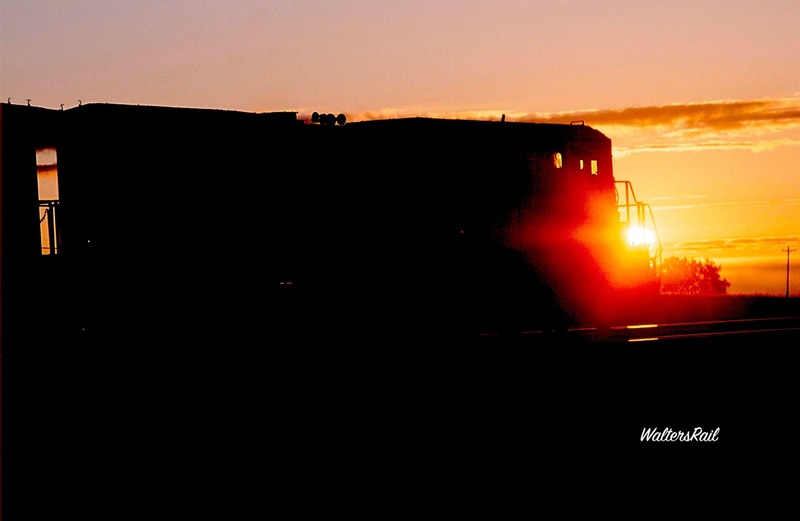 A loaded coal train rushes east beside a rapidly setting sun. The Sandhills encompass approximately 19,300 square miles, stretching 265 miles east to west, with dunes as high as 400 feet, as long as 20 miles, as steep as 25 percent -- the largest dune formation in the Western Hemisphere, now stabilized by grasses with roots only a few inches deep, grasses that can easily be pulled up to reveal the raw sand below that would once again blow across the high plains with nothing to stop it -- were the climate to turn suddenly dry again, as in the epoch which created the sand in the first place. By comparison, Maryland is 12,407 square miles; New Hampshire 9,349. This is a semi-arid landscape, with rainfall averaging from 22 inches in the east to 17 in the west, yet the various valleys between the stabilized dunes often support small lakes and/or marshes, because the whole territory sits directly on top of the Ogallala Aquifer that holds an estimated 700-800 million acre feet of water. Thus, in even the driest times, you will find pristine, spring-fed lakes and ponds glistening in the bright Nebraska sky. Look at an aerial photograph of the Sandhills, and you will see the lumpy hide of a rhinoceros speckled with hundreds of dots in the crevices – the small lakes that are havens for migratory waterfowl. The rivers through the Sandhills are also spring-fed and flow at a consistent rate year-round, rarely flooding, never drying-up. A loaded coal train lumbers beside one of the hundreds (thousands?) of lakes in the Sandhills. 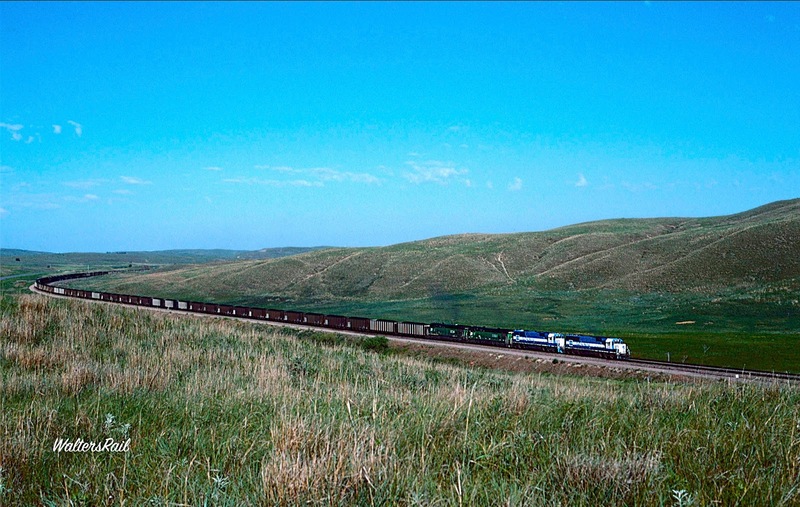 The Burlington and Missouri River Railroad was constructed through the Sandhills in 1887-88. In those days, the spring-fed ponds and lakes were the breeding grounds for millions upon millions of mosquitoes, and a great deal of the railroad’s construction involved the draining of the standing water that produced the miserable insects in such quantities as to make a man’s bare arms look as though they were covered with long, black sleeves. Accounts of the construction crews, most from Illinois and Iowa, are filled with long passages bemoaning the Sandhills as the most God-forsaken land on the planet. In fact, for many years, up to and including the 1870’s, most Americans considered the Sandhills uninhabitable. Miles upon miles of sand, plus sparse rainfall, made the area unsuitable for farming. Many geologists believed that the area would soon revert to a dune-covered desert as large and forbidding as the Sahara. This view slowly changed when ranchers discovered that the land was well-suited for grazing cattle. The 1862 Homestead Act allowed settlers to claim 160 acres, and some chose land in the Sandhills and brought cattle with them. Over time, larger and larger ranches were consolidated. Indeed, the building of the railroad was precipitated by the need for transportation to the slaughterhouses in Kansas City and Chicago. According to the most recent sources I have found, almost 600,000 beef cattle graze year-around in the Sandhills. 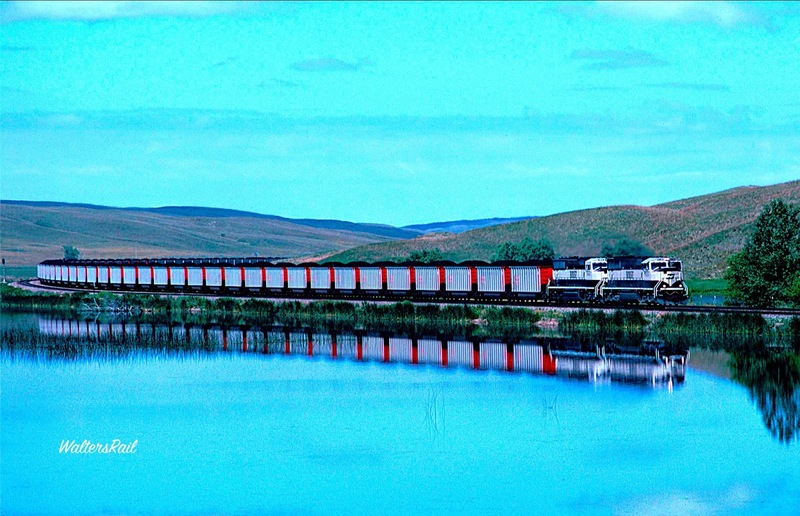 Another coal train rolls beside another lake in the Sandhills. Geographers divide the Sandhills into six subcategories: (1) choppy sands, (2) sands, (3) sandy, (4) sub-irrigated meadow, (5) lakes and wetlands and (6) blowouts. Choppy sands occur on dunes with slopes of about 20 percent or greater. Gravity causes slippage, exposing the underlying sand along the hillside, producing “catsteps.” Topography consisting of gently rolling hills and valleys is referred to as “sands.” While the dune sizes may be nearly the same as in choppy sands, the slopes are more gradual. Areas between dunes are called “sandy” ranges, essentially flat, with slopes of less than three percent. Sub-irrigated meadows are located between dunes where groundwater is close to the surface. Plants grow here abundantly. With such rich vegetation, sub-irrigated meadows serve as good ground for cattle-grazing and are usually hayed by ranchers during the summer. As discussed above, lakes and wetlands are created by the Ogallala Aquifer. Little of the precipitation in the Sandhills runs into streams and rivers. Rather, most percolates through the sand, quickly recharging the water source below. Lakes form between dunes. Wherever the land dips below the water table, it is filled by groundwater. Thus, the number and size of lakes in the Sandhills depend on the level of groundwater each year. Blowouts are sandy areas, where wind erosion “blows out” a hole in the sand, and are scattered throughout the Sandhills, varying in size from a few feet to a hundred yards or more. Blowouts occur where plants die, exposing sand to the wind. As the wind blows, the hole expands, making the establishment of new plants difficult, if not impossible. A few species, however, thrive in blowouts; for example, the Sandhill Muhly (a grass). As the Sandhill Muhly stabilizes the soil, other plants establish themselves, stabilizing the soil even more, allowing additional plants to grow. Eventually the blowout is completely stabilized, returning to typical sandhill prairie, a process taking many years. 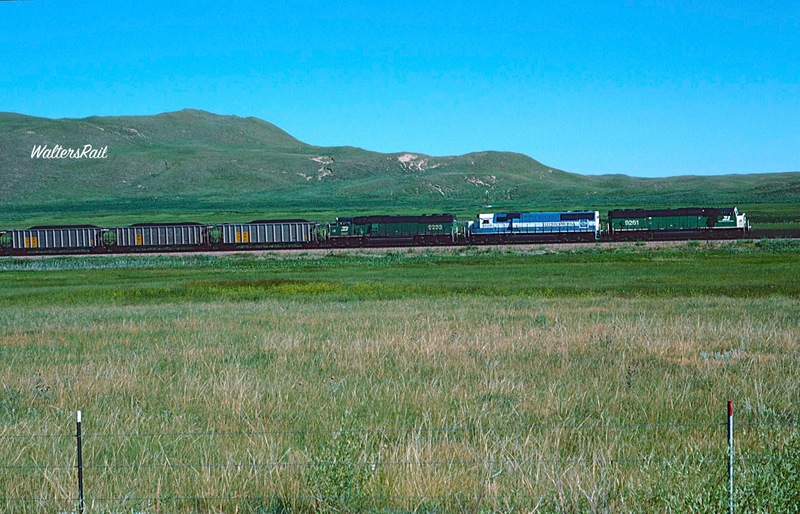 A coal train without a crew waits at sundown in the Sandhills. 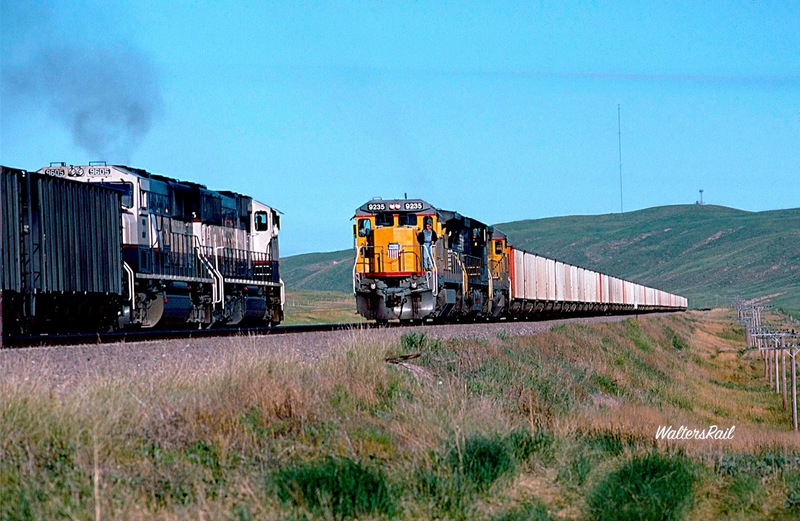 Coal empties are led by a C30-7, with a small blowout to the right of the train. A rare manifest hurries east along the edge of a building thunderstorm. The creation and age of the Sandhills have been subject to multiple theories. I have assumed that at the end of the last ice age (in the Pleistocene), run-off from the melting glaciers in the Rocky Mountains brought huge volumes of sand downriver toward the Gulf of Mexico. My home state of Oklahoma is covered by large areas of sand and sandstone that have been stabilized by vegetation in the past thousand years or so. Remnants of those old dunes are still displayed at Little Sahara State Park near the BNSF Transcon on Curtis Hill. I have theorized that massive amounts of sand similarly washed down across what is now eastern Colorado to be deposited in current western Nebraska. Another empty coal train rolls west. 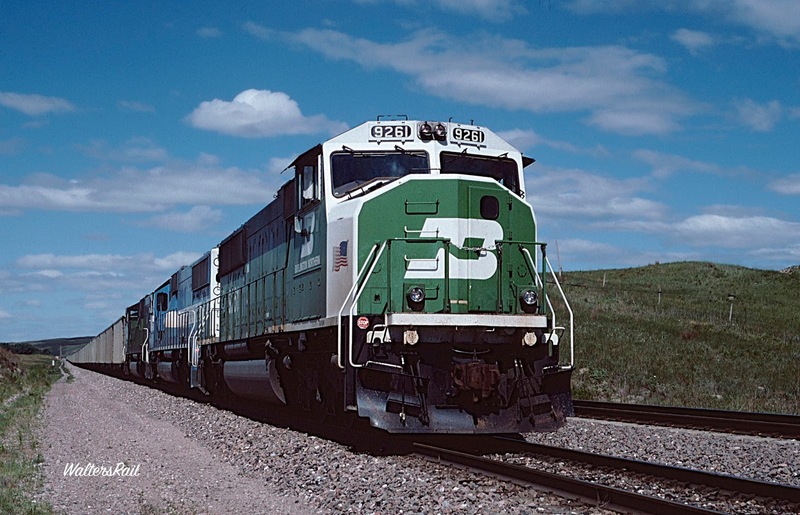 The second unit, BNSF SD60M 9297, was painted in an experimental scheme using the colors of the Burlington Northern's Grinstein Green and Great Northern's Omaha Orange. 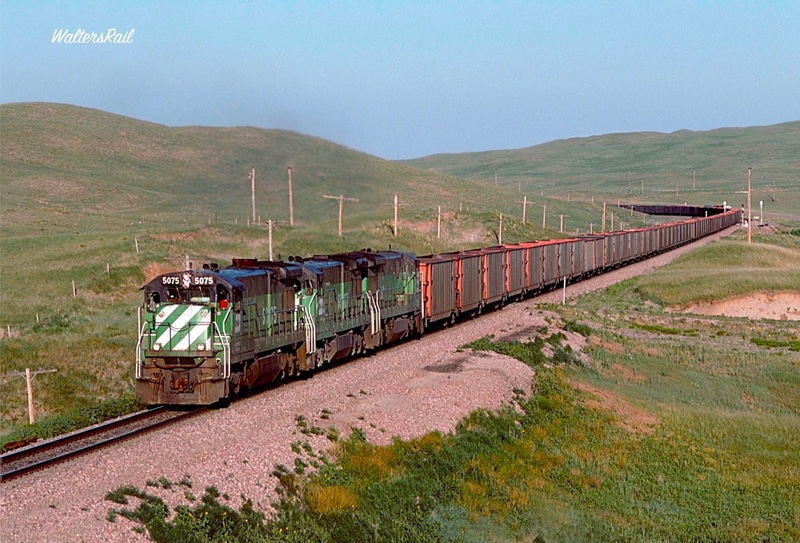 To my knowledge, this was the only BNSF unit to wear this scheme. 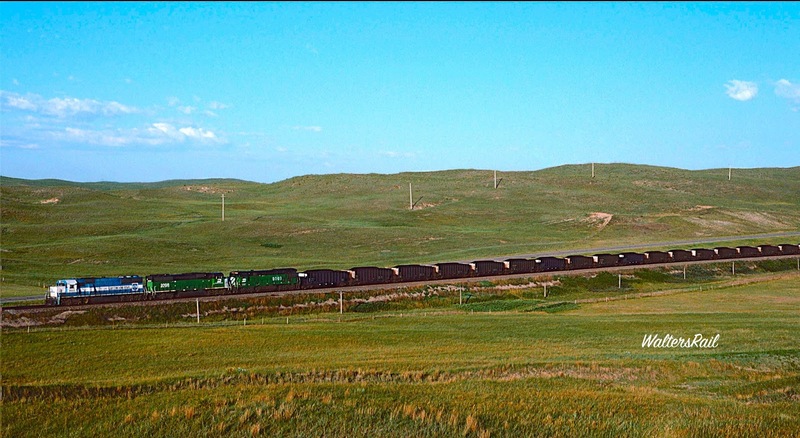 Coal loads and empties meet in the Sandhills. Thus, it seems likely that west central Nebraska was a harsh desert within the past 10,000 years. If so, then the odds of the SandHills “reverting to type” seem to be non-trivial. 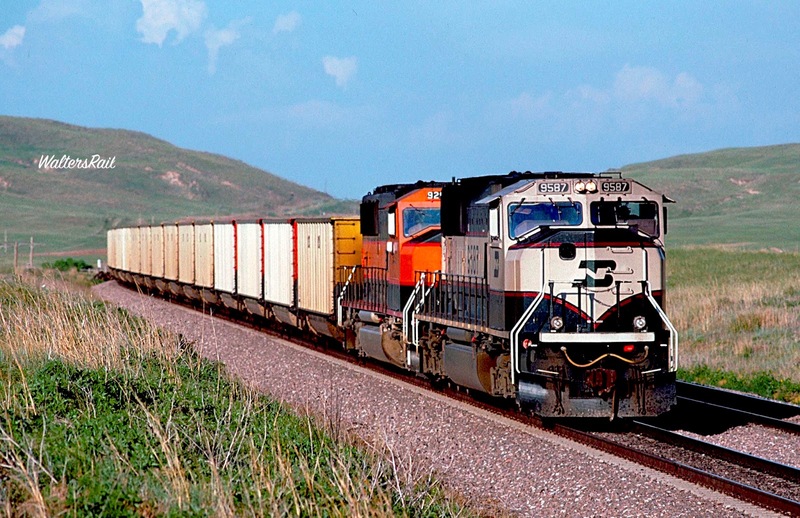 I always approach the Sandhills from North Platte, Nebraska, the location of UP’s massive rail yard at the confluence of the North and South Platte Rivers. U.S. Highway 83 runs north through the river valley, generally green through the growing season due to abundant ground water and frequent irrigation. Once the road climbs the bluffs above town, the landscape changes rapidly. Green grass is replaced by various shades of brown and dry lumpy hills indicative of a semi-arid climate that sees about 20 inches of rain per year. There is not a tree in sight. You are now in the High Plains of western North America, a land so breathtaking in its vastness as to defy adequate description, though that has not stopped people from trying, including myself. When driving across the High Plains, I always begin to lose orientation, because there are few landmarks to provide guidance. It is, for me at least, the same experience as getting lost in a forest. Every way you turn, everything looks about the same. 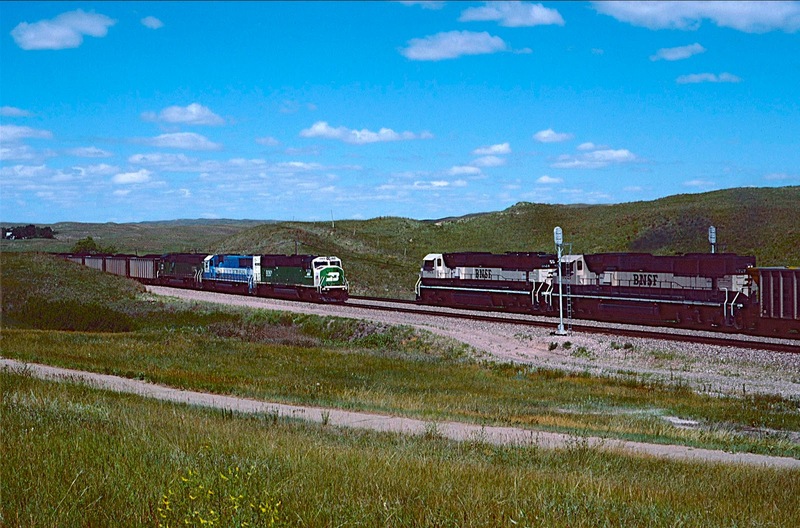 A merchandise freight is climbing out of the valley of the Platte River, with the North American High Plains in the distance. 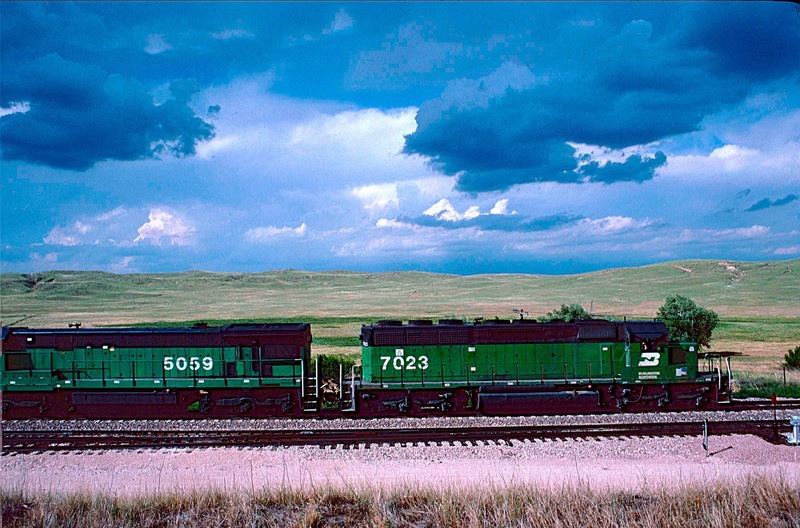 A pair of Grinsteins is hauling empty coal cars through the Sandhills. Behind the train are a number of small blowouts. And so you continue driving north. You are on a Blue Star Memorial Highway, one of many in the United States that pay tribute to the U.S. armed forces. The National Council of State Garden Clubs started the program in 1945 after World War II. The blue star was used on service flags to denote a service member fighting in the war. You cross the South Loupe River, a gentle stream belying the harshness of this country’s weather. This is an area with a growing season of less than five months, only 147 days on average, from around May 7 to October 1. The average low temperature in January is 15 degrees. The average high in July is 90. The average annual snowfall is about 35 inches, and the wind almost always blows. Snowstorms can be vicious; visibility can quickly drop to zero. It is difficult to say where the Sandhills begin. Somewhere north of Stapelton, a village of a few hundred hardy souls, the exposed soil between sparse grass slowly turns from medium to light brown. A few, widely-spaced hills appear. The hills grow taller and closer together. Then you realize that the soil now looks exactly like sand – because it is. You feel as though you are leaving one room of a very large house and entering another. You come to the Dismal River, another bucolic stream with regular year-round water flow, where you encounter a few Eastern Red Cedars and Cottonwoods growing along the banks. 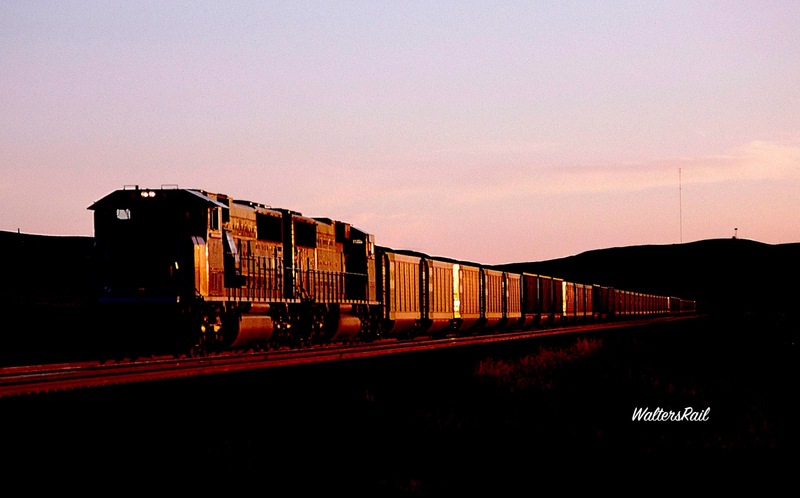 This crewless, empty coal train is waiting on the mainline at dawn on the edge of the Sandhills. Ground fog, a common occurance in this area, is caused by the high water table of the Ogallala aquifer. Here is another in the endless columns of eastbound coal loads. Although you cannot see it from the highway, about six miles to the east is the Nebraska National Forest, established in 1902 by Charles E. Bessey, who believed the area to have once supported a natural forest. As an experiment to see if forests could be recreated in treeless areas of the Great Plains, he began planting pine trees in the sand, resulting today in a 20,000-acre preserve, the largest human-planted forest in the United States. Today the forest's nursery supplies 2.5 to 3 million seedlings per year. And now you arrive at Thedford, which I have always used as my base when visiting the Sandhills. With a 2010 population of 188, Thedford is more or less the center of the universe in this part of the world. There are two motels and two restaurants/bars where one can enjoy the comforts of civilization. As a bonus for railfans, the BNSF double-track mainline runs directly across the highway from town. My friend Carl Graves and I have always stayed at the Roadside Inn, a small but comfortable establishment slightly east of the main town. A restaurant, with very cold beer, operates immediately next door. Two words of warning. Cattle have been known to graze directly outside the motel windows and can keep you awake if you are not accustomed to the sound of grass being chewed all night long. Also, early October is deer season, and the motel is packed with hunters, so make reservations in advance if you plan on traveling around Columbus Day. One of the many blessings of a place like Thedford occurs after sunset, when the sky grows intensely black. There is no light pollution in the Sandhills, and one can see stars from horizon to horizon. The effect is overwhelming for a city dweller like me, because for one of the few times in my life, I come face-to-face with the vastness of the universe and the tininess of my life on this mortal coil. At Thedford, the only thing to break the murmur of the wind at night through the Sandhills grass is the almost constant sound of approaching or departing trains, which can be heard for miles – a soft, swishing like a small stream, steadily growing louder and harsher, until now it sounds like a long chain being dragged across a concrete driveway, and now you can see the train’s headlights, and all this without anyone to bother you or ask why in the world you are sitting in the dark beside the railroad tracks in the absolute middle of nowhere. 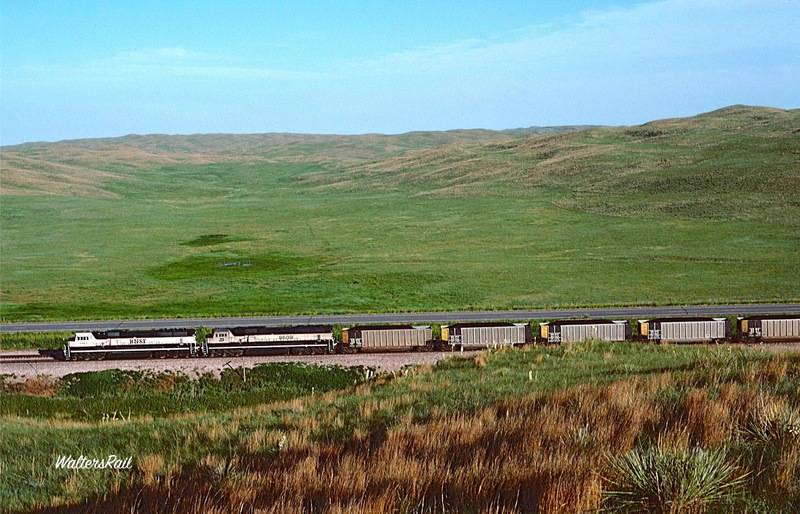 A loaded coal train sits below one of the tallest dunes in the Sandhills. 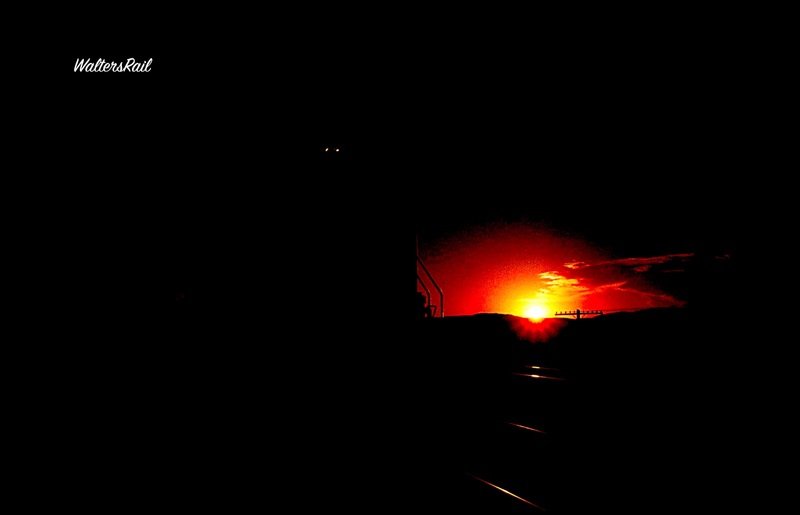 Just west of Thedford, Nebraska, an eastbound coal load chases the rising sun. Thedford and the railroad tracks sit just north of the Middle Loupe River, which several miles downstream joins the North Loupe to form the Loupe River, a tributary of the Platte. “Loup” means "wolf" in French, from trappers who named the river after the Skidi band of the Pawnee, the "Wolf People" who lived along the river’s banks. The Loupe and its tributaries are known in the Sandhills as "the Loups," comprising over 1800 miles of streams and draining approximately one-fifth of Nebraska. Both the railroad and Nebraska State Highway 2 head due west out of Thedford, following the valley of the Middle Loup, though the road from time-to-time climbs the bluffs above the water and looks down onto the railroad below. In the summer, you will occasionally see canoeists, rafters and kayakers flowing serenely down the blue water. I am told that this is a wonderful place for a family to float, because there are no rapids, and the stream is almost always deep enough to avoid portage. More loaded coal rolls beside the Middle Loupe River. In about 25 miles, you will reach Mullen, population 509 in 2010, where you will find a drive-in restaurant and gas station – at least you could find them the last time I stopped there. Between Thedford and Mullen is almost nothing but the river, steeply-slopped, grass-covered dunes and grazing cattle. There is one small village called Seneca, with an estimated population of 35 in 2015. About a mile west of Seneca, you will cross into Mountain Standard Time and gain an hour. When I was young and my father told me we were crossing into Mountain Standard Time, I expected something important to happen, like a flash of lightning and a thunderclap, or at least a shift in the wind. But nothing happened at all. I have driven across the time zone many times in the Sandhills. Nothing happened then, either. I consider this one of the many disillusionments of adulthood. Just west of Mullen is a nine-hole golf course cut through low dunes. Many years ago, I played golf competitively, and I always wondered why fairways and greens were surrounded by sand traps. The courses I played were nowhere near any sand, which had to be trucked in from miles away. Then I was told that American courses contained sand traps because the original courses in Scotland were covered with them. Okay, so why did the original Scottish links contain sand bunkers? I discovered why when examining the course in Mullen, which is built entirely on sand. The bunkers on that course are small “blowouts,” as described above. The bunkers are naturally occurring hazards and are not man-made. Later, when I took a trip to Scotland, I discovered the same thing. Scottish “links” courses are built near the ocean, mostly on sand. Bunkers there are also naturally occurring hazards. So there you have it. 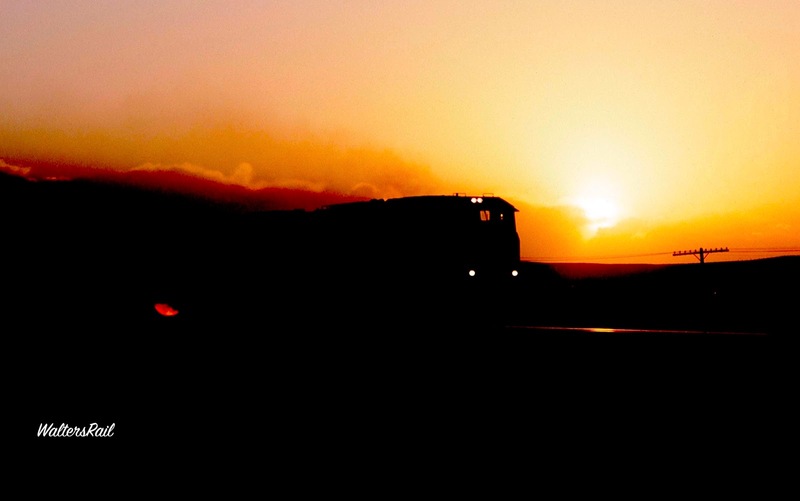 A motionless train awaits a new crew. The same train, with new crew aboard, blasts east. West of Mullen, both highway and railroad leave the valley of the Middle Loup and wind through dunes of various sizes and shapes, some of which are astoundingly large. If this area were to return to desert and the grass disappear, the dunes would rival those in Tunisia, some of which were featured prominently in A New Hope, the first movie in the Star Wars serial. 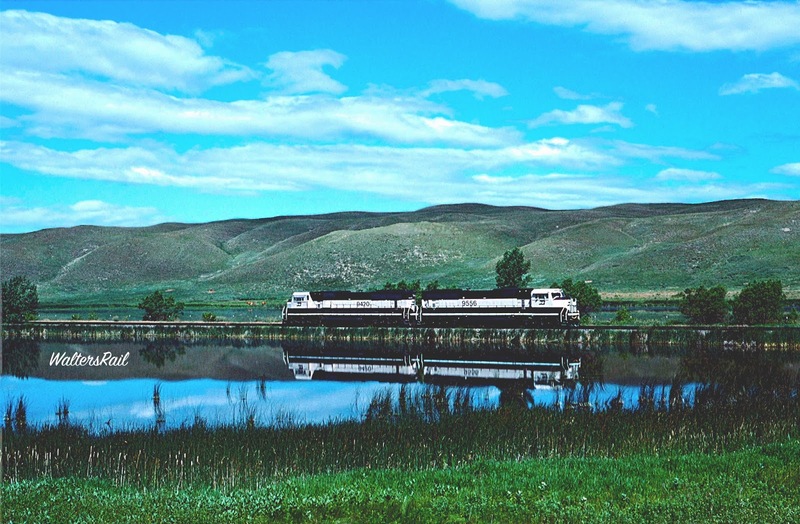 Beyond Whitman, the BNSF crosses Doc Lake. The images in this post were taken in 1997. Since then, many trees have grown between the water and the tracks, making photography more difficult, though not impossible. In years past, the railroad right-of-way was mostly clear, making Doc Lake a favorite location. I have been unable to discover the origin of the lake’s name, so I’m guessing it was named after a local dentist – a latter day Doc Holiday. Light engines are crossing Doc Lake. 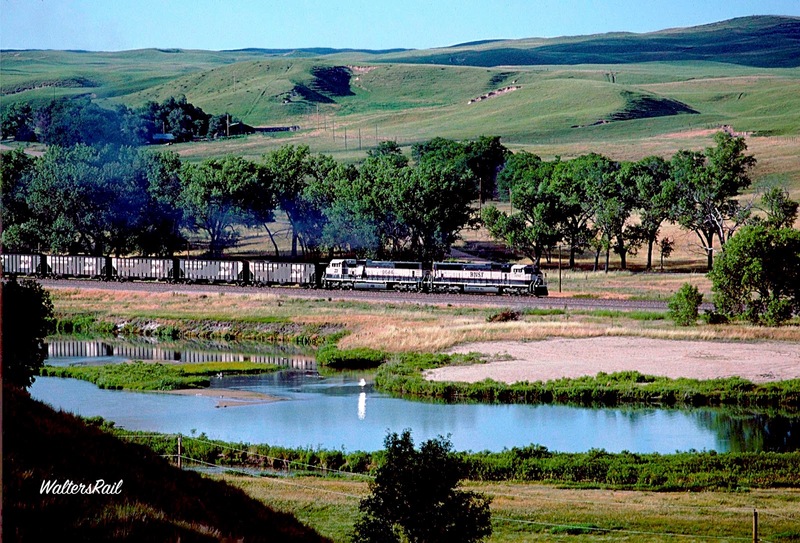 As we continue west, the BNSF passes another aquifer-fed body of water – Beem Lake – on the eastern edge of Hyannis, Nebraska, with a population of 182 in the 2010 census. As you drive into town, you pass the small consolidated school and football stadium. One fall evening many years ago, I was passing through the village while a football game was in progress. There looked to be about 30 people in the stands. Curious, I searched the radio dial and to my amazement found that the game was being broadcast on a local AM station. The announcer sounded breathless as he described the star player for Hyannis High, who soon thereafter scored a touchdown. Sadly, the local station had little power, and I lost the signal before another touchdown was scored. But it did my heart good to know that all across the United States that evening, in places as crowded as New York City and as isolated as the Sandhills, football was being played, and announcers on local radio stations were breathlessly describing the local star. I had located a benchmark. 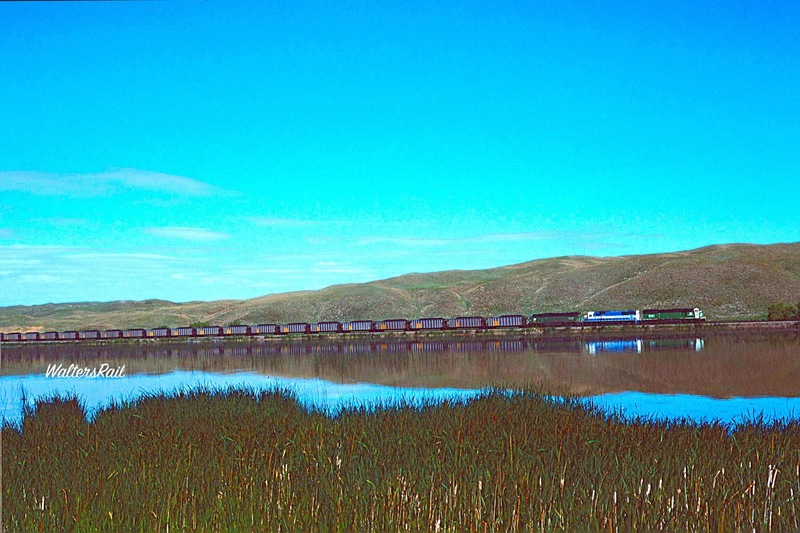 Beem Lake silently watches another passing coal train. Past Hyannis, railroad and highway unroll side-by-side, curving first left, then right, between grass-covered dunes that, at times, rise from the ground like mountains. 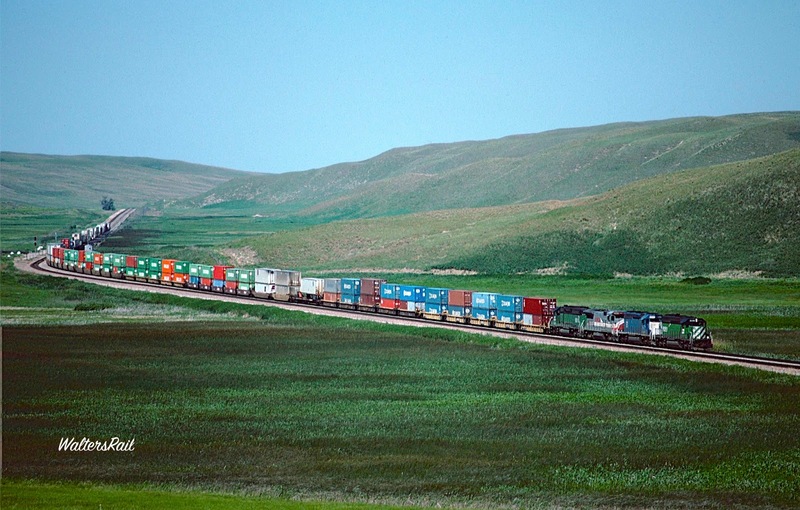 When I drive this world, I think of the railroad workers who first attempted to tame this country. I use the word “attempted,” because no one, truly, can tame the sand hills. “We do not ride upon the railroad; it rides upon us. . . . Did you ever think what those sleepers are that underlie the railroad? Each is a man . . . The rails are laid on them, and they are covered with sand.” Henry David Thoreau. Next comes Ashby, Nebraska. If you look up Ashby on “Bestplaces.net,” you find the following: "The 2016 Ashby, Nebraska, population is 195. There are 0 people per square mile." Apparently, the population of Ashby is a rounding error. BNSF meets Union Pacific beneath a towering sand dune. 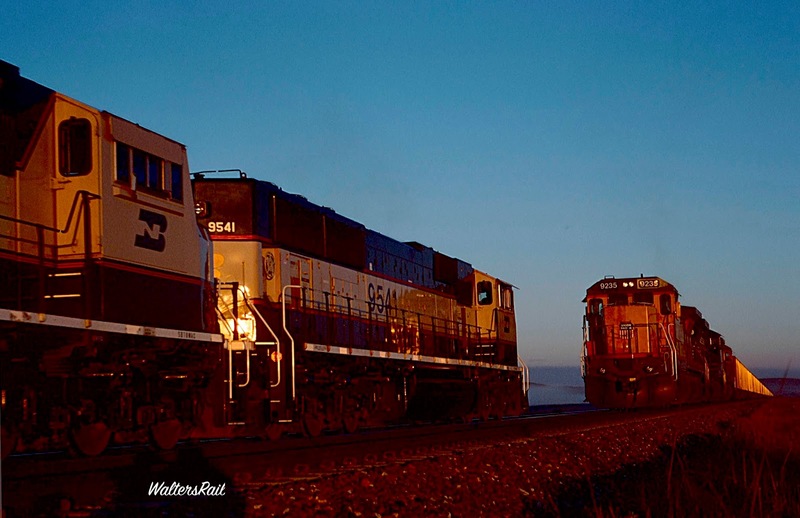 The same UP coal train meets another BNSF at dawn. The same train has now entered one of the short sections of single track that still existed in 1997. 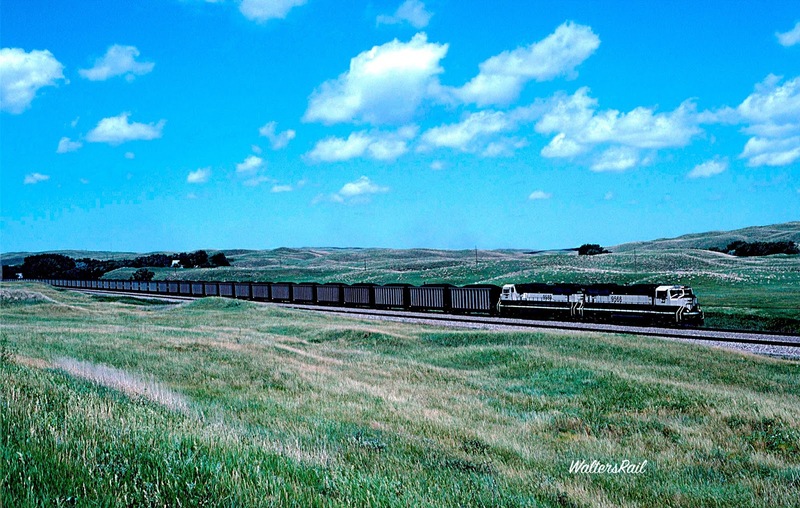 With two Oakway units on point, a loaded coal drag enters the towering dunes of the Sandhills. When the tracks next diverge significantly from the highway, they cross another small pond on a landfill. I cannot find that this pond has a name. Behind the water, the dunes rise like the bleachers in the small football stadium at Hyannis. Then come Bingham, Ellsworth and Lakeside, all tiny settlements, and now you are squarely in the middle of the Sandhills lake country. The land has been climbing steadily. Elevation at Lakeside is 3,881 feet. Everywhere you look, everywhere you walk, everywhere you drive, you find a body of water, some perhaps a half-mile across, others no more thirty yards. Near Lane Lake are the Blue Gill Cabins, the only inhabited structures in any direction for twenty miles, which claim to have a restaurant and to be “kid friendly.” I have never stayed there but am quite certain that on a clear night, sitting outside is like leaning back in a chair in a planetarium, the stars so vivid, so bright, so close that they look touchable. And now you approach Antioch, Nebraska, which once called itself the “Potash Capital of the World.” When the First World War broke out, the United States was cut off from European sources of Potash, a major component of fertilizer. Two University of Nebraska graduates in chemistry developed a method for separating potash from the alkaline lakes of the Nebraska Sand Hills. Large-scale production began in 1916. Potash-producing brine was pumped from the lakes to reduction plants near the railroad. By the spring of 1918, five plants were in operation. When the war ended, importation of foreign potash resumed. Because potash in France and Germany could be produced far more cheaply than in Nebraska, Antioch collapsed. The last plant closed in 1921. Today, the ruins of reduction plants and pumping stations stand near a still-functioning post office that must be one of the loneliest in these United States. 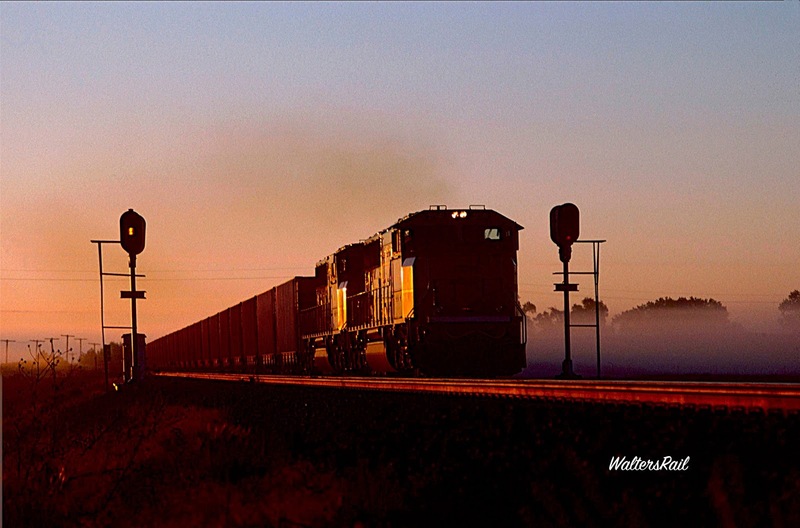 Coal loads approach Antioch, Nebraska. Six miles west of Antioch, the Sandhills stop. They do not dissolve gradually back into the high plains of western Nebraska. They stop. Literally. Their end is as clearly marked as the shoulder of a highway. One second you are are driving between the same look-alike dunes you have been passing for over 200 miles, and the next you are passing irrigated corn fields, with no hill in sight. The transition is sudden, stark and complete. I have found no discussion of why the western border of the Sandhills is so precipitous, unlike the southern border. So I will make what I hope is an educated guess. In my small corner of the world, Oklahoma, the rivers in the center and west are half-full or less most of the year, and much sand is exposed beyond the waters. Invariably, the sand congregates and piles, forming dunes, on the north side of the rivers, because the prevailing winds are from the south. Over the eons, all the loose sand on the south sides of rivers has blown across to the north, so that the line of sand on the south sides of rivers is very clear and abrupt. Perhaps the same explanation applies to the Sandhills, where the prevailing winds are from the northwest. 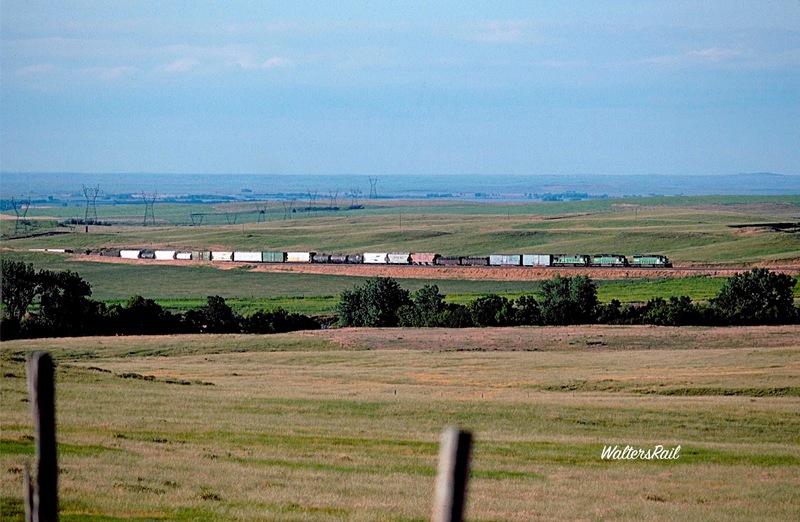 I can remember standing in the Sandhills one Fourth of July, waiting to photograph an approaching train, while the wind howled out of the northwest from Wyoming and beyond. Such breezes over thousands of years could have created the same sort of “line of demarcation” as one sees in the sand along the south banks of central and western Oklahoma rivers. In any event, that’s my story, and I’m sticking to it. 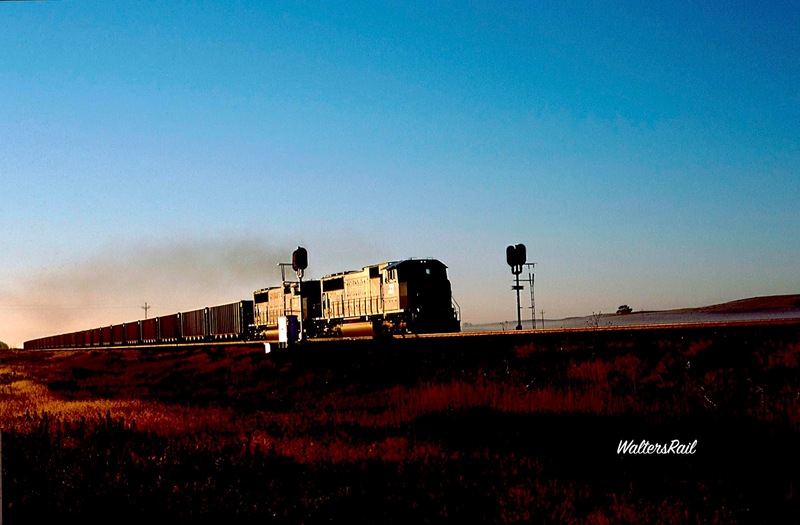 This westbound coal empty has just left the Sandhills on its way to Alliance, Nebraska. I hope you have enjoyed this brief tour of the Sandhills. If you have never been there, do yourself a favor. Go.